While ESPN and the NCAA dig into the numerous - and possibly illegal - pay-for-sign events involving reigning Heisman Trophy winner and Texas A&M quarterback Johnny Manziel, we've uncovered some evidence that the suspicious saga might have commenced right here in Dallas. After A&M's epic upset of Alabama. That's right, during the Aggies' season. Let me begin by saying I don't think Johnny Goofball will be suspended. Short of a video or paper trail directly tracking cash changing hands, he's got an alibi. And it's name is Nathan Fitch, or "Uncle Nate." My best guess is that Uncle Nate, Manziel's 20-year-old personal assistant, will take the bullet for his buddy. He'll tell NCAA investigators - who lack subpoena power - that he acted alone, went rogue and betrayed, deceived and exploited Manziel by having the quarterback sign items for "charity", then going behind Manziel's back and personally profiting off the sales. The NCAA will find that Manziel was an oblivious victim, guilty of nothing more than being both naive and duped. Manziel will feign hurt. At least publicly - wink - he'll sever ties with Fitch. And we'll all be treated to another season of his riveting on-field entertainment starting Aug. 31 against Rice. I also have reason to believe it's the biggest college football scam since Manti Teo fell in love with a ghost. Dallas-based Heritage Auctions has in 2013 sold 19 Manziel-autographed items for almost $10,000, highlighted by a pair of signed, game-worn cleats from the Alabama game that certainly pre-date the scope of the current, known investigation. As of its latest story, ESPN's Outside The Lines alleges Manziel engaged in six signings for three brokers in three states in less than a month, starting with a South Florida session in early January while attending the Alabama-Notre Dame BCS National Championship Game. ESPN estimates Manziel signed over 4,400 items. The NCAA, of course, is investigating whether Manziel was paid for any of the autographs, which would be a violation of Bylaws and would subject the quarterback to possible suspension. But turns out the red flags go back to November 10, in the wake of Manziel's stunning, spectacular performance in which he propelled himself into the Heisman race with 350 total yards and two touchdowns in the 29-24 upset of the No. 1 Crimson Tide. In this Sports Illustrated article, Manziel details an incident he says happened the night before the 'Bama game at the Birmingham Hilton Hotel. He claims a broker forced himself into the room as he and roommate Ryan Swope checked in, and asked the quarterback to sign a backpack full of memorabilia. The broker later sent ESPN a photo of the unpaid, impromptu signing, but added that he was told by Uncle Nate that he would have to pay Manziel for future sessions. That was supposedly before the 'Bama game. Think of Heritage Auctions as a rich man's eBay. The company has approximately 850,000 members and over the past 12 months has generated over $900 million from auctions and sales. One of the perks of being on the company's exclusive mailing list is periodically being sent a catalog in advance of primo auctions. Those books, of course, take time to produce. Photographs of items. Authentication of items. Detailed write-ups of items. Categorizing items. All sometimes spread over 300 high-quality, higher-gloss pages. That exhausting process is where Johnny Football comes in. Heritage Director of Sports Auctions Chris Ivy hasn't returned our calls but in talking to an autograph broker and a couple more folks who know the auction business, it's clear that the Johnny Goofball cleats in question were somehow - by someone - fast-tracked from field to for-sale. The normal turnaround time for an autographed item to be signed and eventually go to auction is about three months. Hence, in step with ESPN's reporting of multiple January signings by Manziel were items sold by Heritage in April, May and some as recently as June 16. 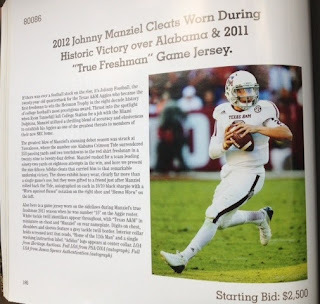 (There are currently no Manziel items on Heritage's web site, but a history of 19 items - including photographs, footballs, baseballs and helmets - sold for a total of $9,979.35.) 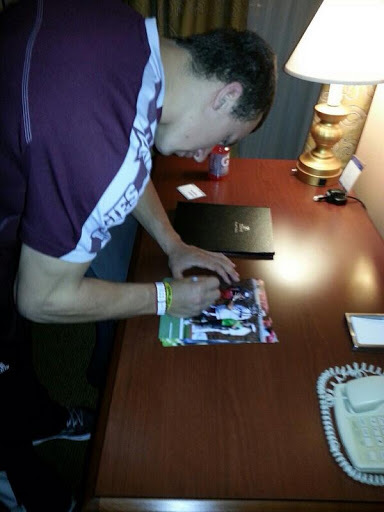 Manziel often accessorized his signature with "#2", "Johnny Football", "Heisman '12", and "Gig 'Em" "#2". 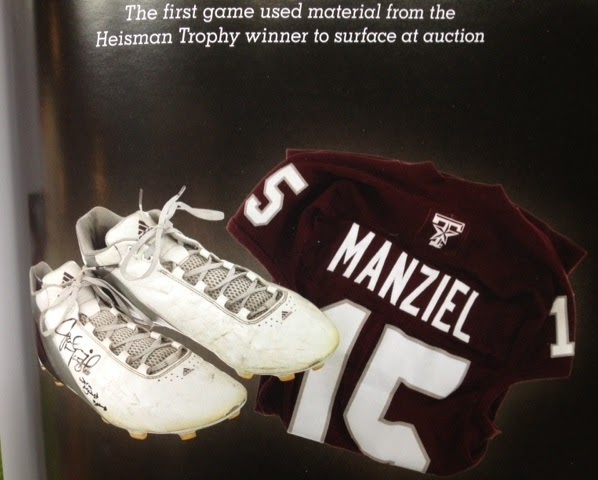 The item that doesn't fit into ESPN's mold are the autographed cleats, which Manziel wore against Alabama on Nov. 10. They, along with a No. 15 jersey Manziel was issued as a true freshman in 2011, were included in Heritage's "Platinum Night" auction Feb. 23-24 in New York that featured multiple keepsakes from former U.S. Olympic hockey hero Mike Eruzione. The item - #80086 - also made it into the pre-auction catalog, which was mailed to customers in early January. 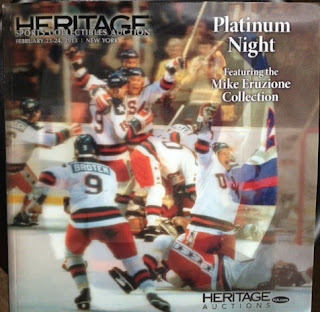 According to a person familiar with the auction catalog production timeline, for the item to have been authenticated, photographed, written up and included in the layout, it would have had to have been in Heritage's hands the week of Dec. 3-10. An almot impossible turnaround, in other words, for a broker. Then ... who? I think we both know the answer. It rhymes with Uncle Nate, the guy who allegedly a month earlier told a broker in Alabama that he'd have to pay for future Manziel signings. The math is a little tricky, but it does indeed add up. The cleats were sold Feb. 23 at the Ukranian Institute of America at The Fletcher-Sinclair Mansion in New York auction for $7,767.50. After a "Buyer Premium" of around 15%, the sale netted the seller a cool $6,600. According to Heritage's web site, the item's owner is "proactively entertaining offers." Who is the owner? And where exactly did those proceeds go? And does Manziel's thorny family tree have anything to do with anything? We may never know. The earliest piece of Manziel memorabilia was sold right under our noses. And this might be the wackiest, unlikeliest mad scramble out of trouble in the career of Johnny Goofball. Dallas + college sports just equals corruption on every level, doesn't it? Yes, I have been watching "Pony Exce$$" again, why do you ask? Sounds like a lot of speculation and questions with no answers. R-Dub, you're crushin' it with the investigative blogging. Now shrink it down, put it all on one page, and you'll still have a bag of nothing. At least I can get back to work quicker. Page clicks dude page clicks. He's gotta pay the bills and page are an easy/lazy way to do it. I don't really begrudge him for it. So, it took you four pages to say "I got nuth'n." If you think this story is "nothing" then, lemme guess, you're an Aggie? Is there a legal, by NCAA standards, to defer payment for this? I don't see why not. Structured in a way that no one profits, even though items are sold, until after his college eligibility or jump to pros occurs. I would love it if some smart lawyers devised a way to stick it to the NCAA. Also, I know we minor leaguers don't have access to "those in the know", I just aint buying the Bulger scenario. Deferred payment plan = Kinda genius. Whether Manziel gets shut down by the NCAA (not likely) or A&M (even less likely), what this as well as his other idiotic, narcissistic and childish actions have done is shown a complete and total lack of judgment, questionable intelligence and some serious immaturity issue.....which is the EXACT OPPOSITE of what NFL GMs and scouts look for in a future NFL quarterback. Manziel could have laid low, played the game albeit with brashness and intensity, kept his mouth shut, his twitter account locked and his pen in his pocket, and more than likely been a top pick in next year's draft and gotten a huge payday. Now no one will be willing to take a gamble on this moron before the middle rounds and even quite a few teams I'd bet will take him off their board entirely. Hope those few thousands he's getting for signing crap for jock sniffers lasts a while. Could have been tens of millions if he was smart and now maybe little or nothing. I guess you don't learn much in those online classes at A&M. JC, Michale Vick negates everything you've said, thought and proclaimed. Get a clue. How so? Get a clue. What I thought....crickets, because Vick and Manziel have nothing to do with each other. And if you're referring to the dog fighting thing, do your homework. Vick signed with Philly for $1.6M, none of which was guaranteed. Last years top QB's, RG III and Luck, both signed for well over $20M, almost all of which was guaranteed and in Luck's case came with a $14M plus signing bonus, even with the new rookie wage scale. That could have been Manziel, but not now. He's Ryan Leaf or JaMarcus Russell (mental midgets), not Peyton Manning or Troy Aikman. NFL scouts and GM's know this (except for maybe Jerry) even if you obviously do not. Ags go 13-0, Johnny Football wins second Heisman, Ags win Nat'l Championship! Greggo got his sponsorship $$$ and then promptly when on a hiatus.